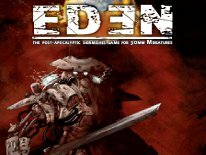 Glue is an essential product for tabletop wargaming hobbyists. Everyone seems to have their own personal favorite, but one thing is for certain, the majority use Cyanoacrylate (CA) based bonding solutions, mostly the gap-filling variety. For the longest time my personal favorite was Zap A Gap, but I've also experimented with many other gap-filling CA-based solutions over the years. Since I'm yet to find a big difference between Zap A Gap, and the lessor known gap-filling CA glues out there, I've leaned towards the cheaper lesser known branded alternatives in recent years. Now I only bother with Zap A Gap Medium CA+ when in a pinch, and the cheaper alternative isn't available. I'm still under the impression that all CA glues marketed for hobby use, of the same viscosity, are created so close to equal, that name branding simply doesn't matter much anymore either. Along comes Filla-Glu. I heard good things about these guys recently, and decided to check their products out for myself first-hand. The first thing that caught my attention is the wide range of products they have available. I was sent a package of samples with Filla-Glu Instant Low Viscosity (LV), Instant Medium Viscosity (MV) and Instant High Viscosity (HV), Filla Glu Powder, Filla-Glu Wicking, Filla-Glu Clear, Filla-Glu Black, and a Filla-Glu KickA-Pen. . The Filla-Glue Instant product seting time is 2-6 seconds for the LV, 5-10 seconds for the MV, and 10-20 seconds for the HV product. Filla-Glue Clear and Black are both impregnated with rubber, and both are High Viscosity consistency products. The Filla-Glu Wicking is a very runny, extremely Low Viscosity product, which is designed to penetrate, and sets very fast. The Wicking is by design meant to be used in conjunction with their Filla-Glu Powder, for filling holes and bridging larger gaps. 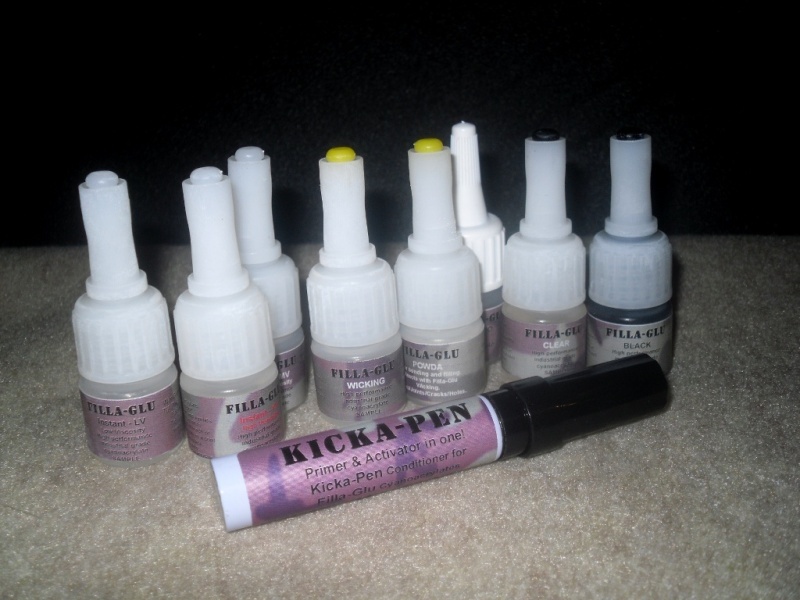 The KickA-Pen is a small felt tipped pen, which is designed to prepare a surface for being bonded, and to accelerate the curing process. They also claim that the conditioner in the pen will enable you to bond unpolare materials like Polyethylene, Polypropyhene, Polyoxymethylene, Silicone and Thermoplastic Elastomere. Lastly Filla-Glue Undo is an organic ester designed to undo Filla-Glu adhesive products, it promises to dissolve and remove CA adhesive, and that it can be used to clean dosing tips, and tools. I've been tinkering around with what they sent me for the past week now. In terms of bonding strength and comparability, I can't say Filla-Glu Instant MV is any worse, or any better than Zap A Gap Medium CA+ and the BSI Insta Cure + CA products I've been using all along. From the Instant variety I prefer the Filla-Glu Instant MV most, because it fills gaps quite well, and bonds fairly quickly as expected. It's the most versatile of the Instant line. The lower the viscosity, the faster the product would set , and the higher the viscosity the longer the setting time is, so I have nothing out of the ordinary to report with their Instant LV, MV and HV products. All of the Instant variety products offer a strong bond, and work just as well as any other hobby specific CA glue that I'm familiar with. The Wicking and Powda is a unique combo. Apply the Powda, and activate it with the Wicking, and it pretty much dries instantly. It works very well for filling some of the smaller gaps, which I'd normally use green stuff for. Once dried this combo is sand able too, so it's not a bad alternative for when you're low on green stuff, or simply out of green stuff. I wouldn't use it exclusively over green stuff, but when you have a small gap between a shoulder and arm, or leg and hip, the Powda/Wicking combo might not be a bad option to pursue if the glue alone you're using doesn't handle the task. The KickA-Pen just doesn't impress me much. I don't feel it works as advertised, nor is it as fast as a CA Kicker/Accelerator Spray alternative. At times it did seem like it accelerated the curing process, and things bonded rather quickly, but other times it appeared to have little, to no effect on the bonding process. I just didn't see enough visual proof consistently that it actually does something, which the CA wasn't already doing on its own. The Filla-Glue Clear and Black are unique products too. Impregnated with rubber particles, these do offer a really strong bond, and being a HV product, the setting time is little longer, but worth the wait if you have a project that requires a little more strength and flexibility than most. I can't say this will ever replace a solid epoxy for the heavier jobs we find ourselves in the middle of at times, but it's step up above most of the Instant HV CA solutions I've ever used in the past. The Clear/Black would come in handy with projects like Warmachine Heavy Warjacks. Some of the Warmachine jacks are posed so crazy by default, that no matter how hard you try, even after pinning, you find you're still having a hard time getting an arm, or leg to stay in place. Pieces which have to carry the bulk of the weight of the model, thanks to an insane pose, is another instance where I think the Filla-Glue Clear and Black might come in handy. Again, you'd still need to pin the models as normal, but if you want a bond that's a little stronger than a HV CA glue alone, this is the next step up, before ending up looking to a messier, and longer curing epoxy-based solution. The Clear and Black are also varied temperature solutions, and since impregnated with rubber, will offer a little flexibility to the bond and shock resistance, which CA alone doesn't offer. I'm not about to drop my models to test how flexible and strong the bond is, but I'd guess that the flexibility of the bond just might come in handy if you were to drop a model from the table to the floor since the bond is said to offer some shock resistance. All of the bottles, aside from Undo, are clog-free tip solutions as well. I think they have the delivery method down quite well. I really do like the bottles, tips and caps they utilize. This is one area where they are ahead of most of the competition, but they're also not the first company to introduce a clog-free tip either. I just think theirs is nicer than most. They do offer what they call Dosing Tips, and since they didn't send any of them along with the sample kit, I can't say much about them first-hand. They do claim these are utilized for more precise application of their products, and they sell them separately via their website. Additionally they offer a variety of other adhesive products which we didn't cover, like various colored CA glues, Low Odor and Sensitive CA glue products, even Gel and Wood Filla Glu products, in addition to kits where you can pickup a variety of the Filla-Glu products in a single combo purchase. The company in general has 30 years worth of experience in creating and selling industrial strength adhesives, and they're still fine tuning the formulas for this line. Even more products are planned yet, so keep an eye on their website for more info on the entire line of Filla-Glu products. I feel that the Filla-Glue Instant LV/MV/HV is just as good as Zap A Gap, and the lesser known BSI CA products I've been using all along, only the Filla-Glue bottles are much nicer and clog less. Therefore you do waste less glue with Filla-Glu bottles. Let me make this clear too...One product might be a hair quicker than another, but I didn't perform any scientific tests to determine who was fastest, or strongest. I just used the glue how anyone else would use it, and that's by assembling metal and plastic wargaming miniatures, and making sure they stayed together afterward by handling them, and tossing them around a little once they were dry. That's as scientific as my tests were. So there may be more minor differences between Filla-Glu and other hobby branded CA options, but what I felt was most important is how well they worked under normal circumstances, and under normal use their Filla-Glu Instant line was no different than any other CA product that I've found to be useful as a wargaming hobbyist, except the delivery method Filla-Glu employs wastes less product. If I were presented with the choice of Filla-Glu Instant, Zap A Gap or BSI CA products at any store, online, or in person, which ever one of the three, that would yield me the most product for the money is the one I'd purchase that day. It's that simple. The difference between the three, I feel, is that minimal. They're all excellent choices. The Filla-Glue Clear and Black are a different story, those are clearly unique products, and are designed for unique projects, the type of projects most other CA solutions alone can't tackle. The Powda/Wicking combo is also unique, and serves a purpose beyond what an average CA product alone can handle. This is where I think Filla-Glu is on to something. Their specialized products is where I think they're strongest, although again, they're not the only company to make rubber impregnated CA, they're just one of the more widely known ones at the consumer level at present who offer it. The KickA-Pen as I stated earlier, just isn't worth it either. Although I didn't test any of the unpolare materials listed that they claim the KickA-Pen helps to bond, the fact is most wargaming hobby product materials aren't included in that list of unpolare materials either, so it's not like I could test those claims. I just don't feel the KickA-Pen accelerated the curing process consistently, or that it did anything noticeable to warrant having one around, over not having one. The Undo however works well, and if you tend to get glue on your file and hobby knives a lot , and you like to keep a solution to undo things around, the Filla-Glu Undo isn't a bad option to pursue. The Filla-Glu Instant LV/MV and HV is sold in 20gram/.67Oz bottles at 3.99 GBP or $6 USD. That's really close to ¾ of an Oz, and at that price, that's not a terrible price, but it's still more than Zap A Gap, and other options. The lesser known Insta Cure+ I use from Bob Smith Industries (BSI) is usually no more than $4.50 USD for a ¾ Oz bottle, and works just as well too, which makes Zap A Gap and Filla-Glu both a hard sell for me if I have to choose between BSI and those two options. They offer a variety of their other products in 10gram bottles, which converted equals .33oz, at a cost of 3.99 GBP or $6.00 USD, this includes the Filla-Glu Undo. Although the Powda comes in a 30gram bottle, and the Wicking comes in 10gram bottles, they offer a kit with both for 6.75 GBP/$10.25 USD, or separately for 3.99 GBP each. The KickA-Pen is also 3.99 GBP/$6 USD, and a total waste of money if you ask me. The Filla-Glu Clear and Black, which are the impregnated with rubber products also come in 10gram bottles, and cost 4.99 GBP or $7.50 USD each, which is more than the regular CA-based options, but other rubber impregnated CA products I've seen are priced higher than CA alone too, so that's a reasonable price. To avoid any confusion...The bottles pictured in this review, are their 5gram bottles, as the review sample bottles are smaller than the normal 10gram-20gram bottles you would end up with if you were to purchase Filla-Glu products. Although they do offer the 5gram bottles for purchase from their website empty. Oz for Oz, gram for gram, or ml for ml, how ever you want to measure it, Filla-Glu is a little more expensive than other branded CA options when buying direct from Filla-Glu. Since they're a fairly new company, there isn't a lot other retailers carrying the product line yet either, and the ones that do that I've seen are only offering 25-50-cent discounts off the prices you pay direct from Filla-Glu. The only things keeping me from recommending Filla-Glu Instant more than any other product is, the lack of better availability here in the US at present, and what they're charging for it. If they were less than everyone else, or even equally priced, their no-clog bottles alone would give them an edge over the competition. The glue itself is easily as good as any other quality product, they just need to infiltrate the US market better now, and do so with more competitive pricing. They're definitely a company worth keeping an eye on.